The Community Foundation Welcomes Karla Lodholz! 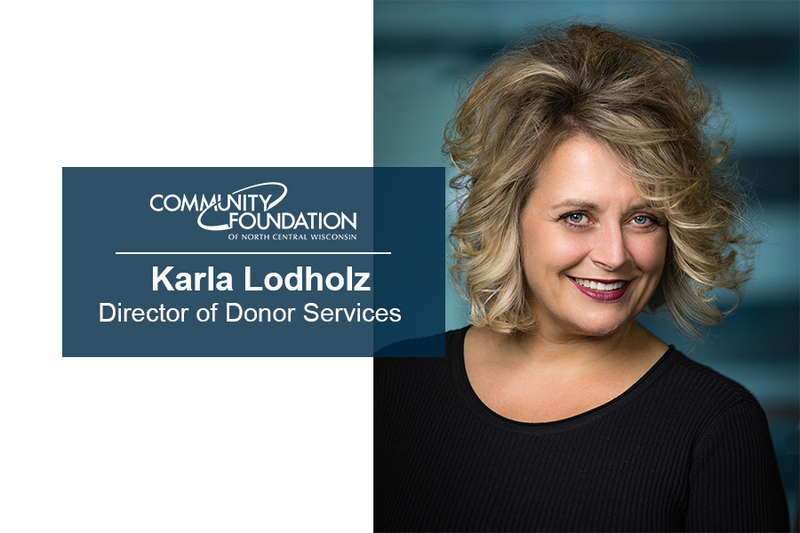 The community foundation is pleased to announce that we have a new addition to our team – Karla Lodholz. As our new Director of Donor Services, Karla will be integrally involved in the Foundation’s new donor development efforts, helping us to accomplish our mission of enhancing the quality of north central Wisconsin. Karla has over 20 years’ experience in the nonprofit sector, having served most recently as the Regional Vice President of the American Heart Association. She is committed to people, business and community in order to have the greatest impact on people’s lives and the communities where we live. A native of Wausau, she is passionate about north central Wisconsin. “We are excited to welcome Karla to our team. As a community foundation, we are focused on donor needs, and on helping our donors to achieve the highest philanthropic results possible” said Foundation CEO, Jean Tehan. “Strengthening our team with the Director of Donor Services position helps us to have an even greater donor focus and will help us to achieve the goals of our strategic plan”. Please join us in welcoming Karla to the Community Foundation team!